Although many factors influence food insecurity rates, education is one strategy that can help alleviate the effects of, and ultimately reduce, food insecurity. Food, farming, and nutrition education provided to adults and children who are living in food-insecure households can help to reduce local food insecurity and improve the quality of nutrition in these households. In Western North Carolina, two programs that provide food education are the Farm to School program and the Expanded Food and Nutrition Education Program. The U.S. Department of Agriculture’s (USDA) Farm to School program seeks to engage public school students with local food producers by stocking cafeterias with locally grown food, organizing farm visits, and funding cooking classes, school gardens, and other hands-on learning activities. Every year the USDA awards $5 million in grants to schools, tribal nations, producers, non-profit groups, and state and local agencies to further these efforts. In addition, other farm to school contacts—such as trade agencies, universities, and public health organizations—facilitate farm to school activities. For instance, in Western North Carolina the Appalachian Sustainable Agriculture Project (ASAP) hosts its annual Farm to School Institute, which brings educators, community members, and health professionals together to discuss the future of farming and nutrition in North Carolina schools. Regionally, during the 2011–2012 school year (based on data reported to the USDA), nine Western North Carolina counties had schools that conducted edible school gardening or orchard activities, ten counties had schools that conducted field trips to local farms, and four counties had schools that brought farmers to visit students at school. Eight counties had schools that held tastings and demonstrations of locally produced food in the classroom, and seven reported schools that were integrating farm to school concepts into their wider curriculum. In addition, 12 counties reported schools that promoted locally grown food in general. 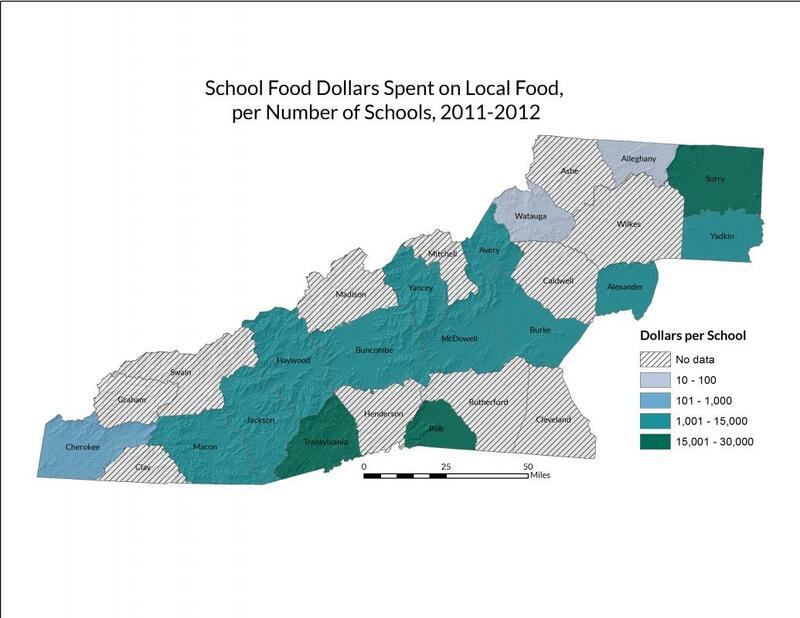 The table shows a full listing of Farm to School activities in the WNC region during the 2011–2012 school year, based on activities reported to the USDA Food and Nutrition Service's Farm to School Census Explorer Tool. Local child nutrition directors have teamed up with ASAP to treat children in Buncombe County to monthly “taste tests” of regional snacks prepared by local farmers and chefs. One Buncombe County school—Glen Arden Elementary—received an ASAP grant to take students to visit a local farm, where they sampled honey, interacted with farm animals, learned about growing crops, and took a hike through the property. In Henderson County, students at Glenn C. Marlow Elementary School were visited by a local chef who helped them turn local apples into delicious salads and baked goods. Fifth graders in Haywood County took a field trip to a historic Waynesville farmers market, where they chatted with farmers and sampled local vegetables. One way to measure the impact of regional farm to school programs is to look at what percentage of public school dollars is being spent on local food. This number varies widely in the 27 counties of Western North Carolina—ranging from two percent in Watauga County to 30 percent in Polk County. Under the USDA Farm to School program, school districts are allowed to define “local” however they’d like, so depending on a school’s geographic location “local” could mean food grown in the county, the state, or the region. 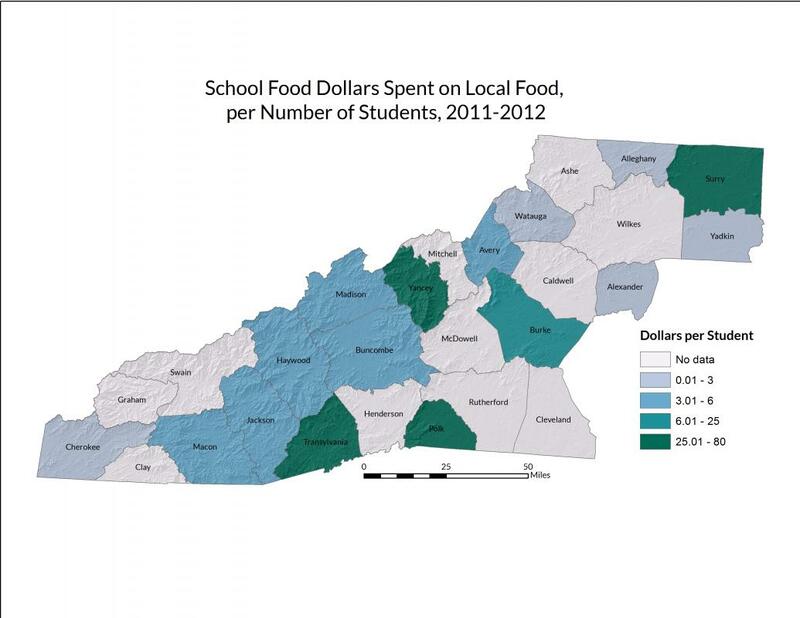 As noted above, however, many Western North Carolina counties are making an attempt to bring truly local food options into their cafeterias. In 2015, a dedicated group of farm to school stakeholders—including representatives from education, state government agencies, private business, and non-profit organizations—formed the Farm to School Coalition of North Carolina (F2SCNC). F2SCNC aims to expand and strengthen farm to school initiatives focused on K–12 students across the state through outreach, network development, and capacity building. 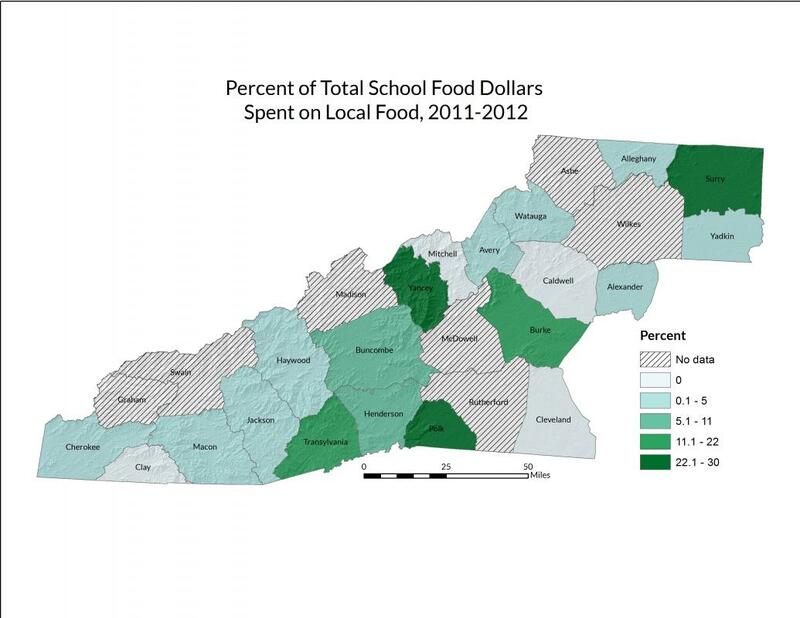 More information, including the coalition's strategic plan, can be found on its website: http://www.farmtoschoolcoalitionnc.org/. The Expanded Food and Nutrition Education Program is a federal government initiative that aims to teach low-income families and youth how to “improve their diets, improve their nutrition practices, stretch their food dollars farther, handle food more safely, and increase their physical activity levels.” Lessons are delivered by peer educators who typically live in the communities where they work and use an interactive, hands-on approach to teaching. Classes can be held in anywhere people gather—at churches, in community centers, through school enrichment programs and 4H clubs, or at youth camps. In North Carolina, the EFNEP program is administered by the North Carolina Cooperative Extension Service. Nationally, the Cooperative Extension Service is a partnership including county governments, a national network of land-grant universities (in North Carolina, this includes North Carolina State University and North Carolina A&T State University), and the USDA. During the 2013–2014 year, EFNEP program activities were reported in ten Western North Carolina counties: Ashe, Avery, Buncombe, Jackson, Macon, McDowell, Mitchell, Swain, Transylvania, and Yancey. During this period, 402 families and 306 youth groups (including activities conducted through 4-H clubs) took part in EFNEP program activities. Appalachian Sustainable Agriculture Project, Growing Minds: ASAP’s Farm to School Program. “School year filled with farm to school success.” Accessed April 2015 from: http://growing-minds.org/school-year-filled-farm-school-success/. U.S. Department of Agriculture, Food and Nutrition Service. “10 Facts About Local Food in School Cafeterias” Fact Sheet. Accessed April 2015 from: http://www.fns.usda.gov/sites/default/files/F2S_10Facts_March2014.pdf. U.S. Department of Agriculture, Food and Nutrition Service. Farm to School Census Explorer Tool. Accessed November and December 2014 from: http://www.fns.usda.gov/farmtoschool/census/explore. U.S. Department of Agriculture, Food and Nutrition Service. “Farm To School at USDA” Fact Sheet. Accessed April 2015 from: http://www.fns.usda.gov/sites/default/files/F2S_FarmtoSchool_March2014.pdf. U.S. Department of Agriculture, Food and Nutrition Service. “Getting the Farm to School Support and Resources You Need” Fact Sheet. Accessed April 2015 from: http://www.fns.usda.gov/sites/default/files/F2S_SupportResources_March2014.pdf. U.S. Department of Agriculture, National Institute of Food and Agriculture. Expanded Food and Nutrition Education Program (EFNEP). Accessed April 2015 from: http://nifa.usda.gov/program/expanded-food-and-nutrition-education-program-efnep. U.S. Department of Agriculture, National Institute of Food and Agriculture. EFNEP National Data Reports. Accessed April 2015 from: http://nifa.usda.gov/efnep-national-data-reports.